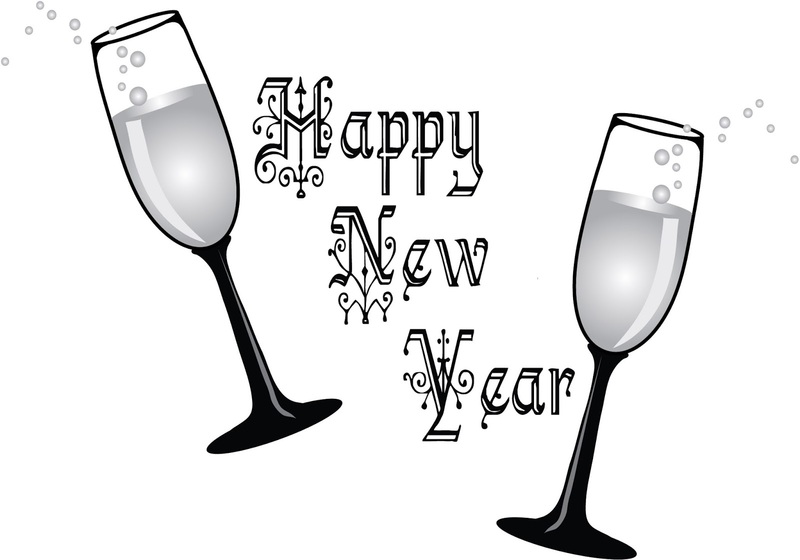 Happy New Year's Eve, and I hope you enjoy your celebrations this evening, whether you go out to a party or have a relatively quiet night at home. Have some bubbly, whether it is Champagne, Franciacorta, Cremant d' Alsace, Cava, or some other type of Sparkling Wine. As the ball falls in Times Square at midnight, I hope you are with family and/or friends, looking forward to the start of 2017. And I especially hope that this New Year is better for you than 2016. As I previously done for the last several years, I want to offer some alternative suggestions for resolutions, all connected to food and drink. Rather than deal in absolutes, or exact measurements, I merely hope that you choose to do your best to follow these suggested resolutions with the simple goal of doing better than you did last year. I don't expect anyone to follow these resolutions all the time. Please just do your best. I think you might find this easier to do than a more specific resolution which is an either/or proposition. Seek continued forward progress in these ten resolutions. Seafood can be extremely healthy for you, especially those fish rich in Omega-3s, so it is an excellent choice for dinner. And seafood is delicious, versatile and often easy to prepare. Yes, it can be more expensive, but it is well worth the added cost. And buying more domestic seafood will help our economy, rather than buying so much imported seafood. Eating more seafood can be one of the healthiest life changes you ever make. It has scientifically been proven that consuming 26 pounds of seafood annually will reduce your chances of heart disease by 36%. An easy and delicious resolution. Don't keep drinking the same old stuff all the time. There are so many wonderful beverages out there to taste, to see if you can find some new favorites. Break out of your rut and endeavor to try something new on a regular basis. If you mainly drink Chardonnay, venture out and try some other white wines, such as Gruner Veltliner, Trebbiano or Albarino. Try Sherry, Sake, Japanese Whisky, Mezcal, Franciacorta, Baijiu, and other under-appreciated beverages. Taste it all, constantly trying new beverages, and continue drinking those you enjoy. It is said that up to 40% of our food ends up as waste, and that is a nearly unbelievable statistic. Do your part to help reduce food waste. Food waste can lead to higher food prices and cause more environmental damage. Don't make as much food as normal when making a meal so you don't have leftovers in the first place. As your mother probably once said to you, finish everything on your plate. Use any leftovers to make additional meals. 1) Start the New Year off right with a pop-up brunch at Juniper, located in Wellesley, on Sunday, January 8, from 11:30am-2:30pm, featuring Avi Shemtov, chef/owner of The Chubby Chickpea and author of “The Single Guy Cookbook.” For one day only, Juniper chef/owner Dave Becker will open for brunch and welcome Shemtov into the kitchen to prepare a Middle Eastern-influenced mid-day meal. Shemtov’s signature Shakshuka – a classic Middle Eastern tomato and egg dish – will form the cornerstone of the menu, alongside other tasty brunch fare, such as Lamb Belly Hash, Confit Duck Benedict, Fried Bacon Gravy and more. Juniper will be mixing up creative takes on the classic brunch cocktails to accompany the feast. Juniper is a Mediterranean bistro, in the heart of downtown Wellesley, and offers creative, generously portioned plates filled with the “feel good flavors” synonymous with Eastern Mediterranean cuisine in an eclectic, colorfully adorned space. Founded in 2010, The Chubby Chickpea aims to be at the cutting edge of Middle Eastern Cuisine, fusing traditional favorites and authentic recipes with fresh local ingredients and contemporary styles. As a fast casual restaurant, Mobile Food Truck and full service catering company, The Chubby Chickpea is committed to delivering the very best in ethnic comfort food. 2) The Hot Toddy is often said to be an excellent way to ease cold and flu symptoms, and has been used for that purpose for centuries. At its most basic, a Hot Toddy is a mix of a spirit, such as whiskey, rum or brandy, with hot water and honey. It also commonly includes spices and sometimes tea or a lemon slice. There are plenty of variations and it is a perfect winter drink. January 11 is National Hot Toddy Day. 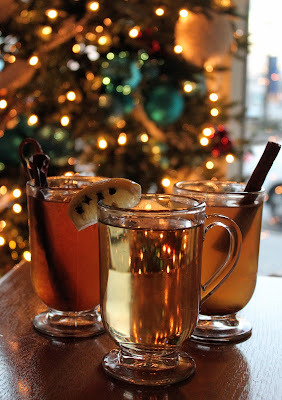 TAMO Bistro & Bar, in the Seaport Hotel, is now offering three different Hot Toddies, which will be available all winter, to warm you up. Each of their Toddies is made with honey harvested from the more than 1 million bees housed on the roof of the Seaport Hotel and then infused with different flavors in-house. So check out these Toddies now, on National Hot Toddy Day, or sometimes else during this winter. At the end of each year, I compile a number of lists of my Favorites of the past year: the top wines, restaurants, foods, cocktails, spirits, and more. These summary posts help my readers more easily find my favorites of the past year, rather than skimming through hundreds of posts on their own. I also enjoy compiling these lists as it enables me to scan over my blog for the past year, to relive many pleasant memories of the food and drinks which most pleased me. In September, I wrote my 4000th blog post, which averages out to about 1 blog post per day for nearly 11 years, and in November, I celebrated the 11th anniversary of my food & drink blogging. I haven't blogged every day, but have made multiple blog posts on other days, so it averages out to nearly one each day. What a long and delicious journey it has been. I certainly never thought initially that my blog would last this long. My Favorite lists do not necessarily address the "Best" of anything, as I have not partaken of everything in any category so cannot pass such judgments. However, every item on these lists gets my strongest recommendations and I have faith that they should strongly appeal to most of my readers. Kudos go to all of those who are listed in my Favorites as they have well earned the accolades. This post collects links to all of my 2016 Favorite lists. Let me continue the lists of my best recommendations and favorites of 2016. I have already posted my Favorite Wines, Favorite Restaurants and other related lists. This post will now concentrate on some of my Favorite Spirits and Drink-Related Items. This is certainly not a complete list but it is more a sampling of compelling and memorable matters I have experienced and posted about over the past year. Favorite Spirits & Cocktail Event: For the third time, Thirst Boston is my favorite event, an excellent four day event dedicated to the diversity of spirits, cocktails and other drinks. There are a myriad of interesting and informative seminars, tasting rooms, parties and much more. The event is well organized, and everything generally runs smoothly and punctually. I always find it educational and fun, with lots of great drinks available. And a number of the spirits and cocktails I enjoyed at Thirst Boston can be found as other Favorites on this list. I highly recommend you check out next year's Thirst Boston. Favorite Bourbon Book: Though I haven't yet written a formal review of this book, Bourbon: The Rise, Fall & Rebirth of an American Whiskey, by Fred Minnick receives my hearty recommendation. It is a fascinating historical look at Bourbon, presenting plenty of information you probably didn't know about Bourbon. As a history buff, I love this type of book, and as I also love bourbon, then this book is a double win. Fred has an excellent writing style, offering many interesting anecdotes about Bourbon. Favorite Single Malt Book: Recently published, The New Single Malt Whiskey, edited by Carlo Devito, is an encyclopedic tome of over 620 pages and is dedicated to single malt whiskey from all over the world. It contains articles written by over 40 writers, covering 197 distilleries from over 25 countries, and reviews more than 325 whiskies. It is an excellent reference tool to explore single malts and will likely intrigue you in tasting many which are new to you. To be transparent, I did contribute a few articles to this book but I have learned much from the other writers in this hefty volume. Favorite Cocktail Supply Shop: Once again, The Boston Shaker, located near Davis Square in Somerville, wins this category. It offers everything you need to create cocktails, except for the alcohol, including plenty of spirit & cocktail books, a wide range of bitters, shakers, stirrers, glasses, and so much more. They also run cocktail classes, book signings and other fun and informative events. It is an excellent place to purchase gifts for the holiday season for your cocktail loving family and friends. Favorite Highland Single Malt Scotch: The Oban 18 Year Old Single Malt is produced by a tiny distillery, located in the Coastal Highlands and next to the ocean. This Scotch iss amazing, with a complex and harmonious blend of flavors, including baked orange, bold spices, a hint of smoke, caramel, and much more. Each sip seems to bring a new flavor to your palate. The finish feels like it won't ever end and it is the type of Scotch you would slowly savor all evening. It seduces your palate and will addict you as soon as you taste it. Highly recommended. Favorite Speyside Single Malt Scotch: The Cardhu 12 Year Old Single Malt is similar to a number of Speyside Scotches, which tend to be fruity in taste. This Scotch has a delightful fruity flavor, ripe plums and figs, with an aroma of sweet Sherry. There are also some intriguing spice notes and a very lengthy and pleasing finish. This Scotch should appeal to many people and would be an excellent introductory Scotch to hook people on this category. Favorite Islands Single Malt Scotch: Talisker Distillery is the only distillery on the Isle of Skye and it is a huge distillery, selling half of their product to Johnny Walker. The Talisker 18 Year Old Single Malt is certainly impressive, with a pleasing smoky aroma and a touch of brininess. The palate possesses a moderate peaty aspect, an interesting nuttiness and an excellent blend of sweet and salty flavors. So complex, with a lengthy finish, this is a killer Scotch which will satisfy anyone seeking a fine, peaty whiskey. Pair it with chocolate or oysters. Favorite Solera-Made Scotch Whiskey: The Black Adder Black Snake VAT 3 Venom 2 Single Malt uses a Solera system that was started about two years ago. They remove about 2/3 of the whiskey from a barrel and then add new whiskey to refill it. It is either finished in Oloroso Sherry or PX Sherry barrels though this particular whiskey was finished in Oloroso barrels, which it sat in for about a year. Each time they remove some whiskey from the barrels, they label it as Venom, so this whiskey was removed for the second time. It is bottled at 114 proof and is strong and powerful but with an elegance that balances it. The flavors are intriguing, a melange of white pepper, honey, vanilla, fennel, floral notes, and hints of aged Sherry. Favorite Irish Whiskey: The Quiet Man 8-Year-Old Single Malt Irish Whiskey is a blend of new and partially-aged Irish whiskey which finishes its aging at the Quiet Man warehouse. The 8-Year Old possesses a more savory taste profile with a pleasing nose of spice, smoke and floral notes. On the palate, it has a hint of sweetness, tastes of caramel and vanilla. Those sweeter flavors though were balanced by a spicy backbone and a hint of smoke. It drinks very smooth and is an Irish whiskey to slowly savor and enjoy, and during the winter, it would be welcome drink on any chilly night. Favorite Irish Cream: The company behind The Quiet Man also produces St. Brendan's Irish Cream, which is named after a sixth century monk. It is made from all natural ingredients, from cream made from the milk of grass-fed cows to their own Irish Whiskey. Bottled at 34 proof, it has a richer butterfat content than many of its competitors. I was impressed with its taste, finding it light, creamy and only mildly sweet, far less sweet than Bailey's Irish Cream. It was delicious, without any artificial taste, and would be the perfect drink to cap off a night. I could easily see this in a cocktail, or even as the basis for a tasty frozen shake. Favorite Rye Whiskey: I've been a fan of the Ryes from Whiskey Pig but their new Whistle Pig 15 Year Old Straight Rye just blew me away. The base of this rye is the 10 Year Old except it sits in the barrel for another 4.5 years and then is finished for anther 6 months in barrels of Vermont White Oak with a #4 char. This is a massively impressive rye, with such a phenomenal, complex melange of aromas and flavors. There is plenty of spice, caramel, butterscotch, vanilla, citrus, and even a touch of smoke. Every sip seems to bring something new to your palate and you won't want to quite sipping until the bottle is empty. It is a liquid aphrodisiac, decadently delicious with a sensual mouthfeel. I can't recommend it highly enough. Favorite Unique Whiskey Blend: High West Whiskey Campfire, blended in Utah, is unique blend of a straight Bourbon, a straight Rye, and a blended peated Scotch (though the specific proportions is secret). All the whiskies used in this blend are at least five years old. On the nose, it has a complex and alluring aroma, with hints of spice, light smoke, honey, vanilla, and floral notes. As I took a hearty sip, I was amazed at the intriguing and complex procession of flavors that seduced my palate, proceeding from a sweet and fruity start, leading through a spicy middle and ending with a mild smokiness. Sweet, spicy and smoky. It was fascinating that you could easily see the influence of each different type of whiskey, none being dominated by any other. The more you concentrated, the more flavors you discovered in this superb melange, from caramel to citrus, leather to baking spices. Overall, it is a silky & smooth whiskey, with a long and lingering finish. Favorite Gin: I'm not usually a fan of gin, disliking the strong juniper flavor I find in many, but I have enjoyed some that I felt were more well-balanced. Caledonia Spirits produces what may be my utmost favorite gins, two exceptional barrel-aged gins, the Barr Hill Reserve Tom Cat Barrel-Aged Gins. Their original spends about 4-6 months in new American white oak barrels tastes more like a whiskey than a gin, pushing the juniper flavor to a minimal element. There are honey notes, enhanced by a spicy aspect and hints of vanilla and caramel. The floral elements are also more of an undertone, and the overall taste is complex and intriguing, delicious and satisfying. Their newest release has been aged for about six months in Vermont white oak. I found this Gin to be softer and more subtle than the other barrel-aged Gin. It is fragrant and elegant, with plenty of complexity and exciting flavors. There is still a whiskey element in this Gin, with a very subdued juniper taste, but it certainly is a more unique spirit in its totality. I would only drink this on its own as in a cocktail, you might lose some of the subtle flavors of this superb Gin. Favorite Spanish-Style Rum: The Mount Gay XO-Extra Old Rum is generally a blend of rums aged from 8-15 years old. The XO is complex and intriguing, a rum to slowly sip and savor. It is silky smooth with delicious flavors of ripe pear, vanilla, toast, and subtle baking spices. It is an elegant spirit with a lengthy finish which will be sure to satisfy and tantalize. You won't be able to take just one sip as your palate will crave more. This is a rum you should drink on its own and which you probably don't want to use in a cocktail. And at only about $40, this is an excellent value too. Runner-Up Favorite Spanish-Style Rum: Diplomatico Rum, based in Venezuela, produces a number of excellent value rums as well as a couple of compelling high-end rums. The 2002 Single Vintage (about $95) is made from rum was aged for 12 years in ex-bourbon and single malt casks and then placed into ex-Oloroso Sherry barrels for another year. This rum presents an intriguing aroma of caramel, vanilla and salted nuts. On the palate, the taste is complex and intriguing, a fine blend of caramel, vanilla, honey, almonds, baking spices, and dried fruit. There are hints of Oloroso in the rum, especially on the lengthy finish. The Ambassador (about $260) is aged in used white oak barrels for 12 years and then spends another 2 years in PX Sherry barrels. This rum will remind you in some respects of an aged Port, presenting an alluring nose of red fruits and exotic spice. On the palate, there are more dried red fruit flavors, baking spices, more exotic spice notes, a touch of leather and a hint of herbs. Complex and fascinating, this is also a rum that would benefit from slowly savoring it on its own. Favorite Agricole Rhum: This French style rum is made from pure sugarcane juice rather than molasses. As such, it is a terroir driven spirit, which molasses-made rums are not. The Rhum Damoiseau Blanc, which is made in Guadeloupe, is 110 proof, unfiltered and has been distilled only once. It is savory and vegetal, with a strong earthy aspect. There are only hints of fruit and it also possesses a long, earthy finish. I very much enjoyed the more unique flavors of this Rhum though it certainly wouldn't appeal to everyone. Favorite Local Rum: Privateer, located in Ipswich, produces some delicious, limited edition rums, including Navy Yard and Queen's Share. Navy Yard is a single barrel rum, aged for at least two years in new American oak, and bottled at 102 proof. It is bold and delicious, with a nice complexity of flavors, including caramel, butterscotch, orange, almonds, vanilla and subtle spice notes. This is definitely a sipping rum, which will deliver new flavors in every sip. The Queen's Share is also a single cask rum, aged for about three years in new American oak, and bottled at 114 proof in very limited quantities. It is a blend of their other three rums and is a lighter, more elegant style than the Navy Yard. However, it still possesses a similar complexity with lots of fruit, honey, caramel, vanilla and spice notes. Runner-Up Favorite Local Rum: In Vermont, Smugglers' Notch Distillery is a father/son partnership which distills a number of products. Their Rum is a single-barrel amber rum bottled at 105 proof. It is aged for about 3 years in charred white oak and then finished for another year in 4-year old ex-whiskey barrels. I was impressed with the complex and delicious flavors in this rum, which had some similarities to a fine bourbon. And despite its high alcohol content, you wouldn't notice it in this smooth and well balanced rum. Such tasty flavors of caramel, vanilla, and baking spices with a lengthy finish. Favorite Tequila: Though the bottle has glow-in-the-dark lettering and symbols, the Suerte Extra Añejo Tequila isn't a gimmicky spirit. Many traditional methods, such as the tacoma, are used to produce this tequila. This is a single barrel tequila, made from 100% Blue Weber Agave, and aged in charred American White Oak whiskey barrels for 5 years. The tequila is a deep golden color with an enticing nose of roasted agave, vanilla, and citrus notes, On the palate, it presents a complex melange of flavors, including caramel, vanilla, orange, baking spices and roasted agave. It is smooth and delicious, with a mild bitterness on the finish, helping to balance the mild sweetness of the tequila. This is a tequila to slowly sip, savoring each intriguing taste, and it drinks so well you could sip it all night. Favorite Mezcal: I delved a quite bit into Mezcal this year, and it is certainly a worthy endeavor. Check out my Mezcal Rant, 400 Rabbits Say "Drink More Mezcal. Tequila seems to get most of the attention but Mezcal deserves much more attention. Trying to select a single Mezcal as my favorite was a difficult task but I finally settled on one, the Mezcal Vago Tepazate. The Tepazate agave, also known as Dub-Cual, is a wild variety which grows quite large and can take as long as 25 years to mature. This mezcal has an impressive and complex taste, with lots of smoky and earthy elements, plenty of herbal notes and hints of citrus and stone fruit. I could have sat there for hours sipping this mezcal, extracting subtle hints of other flavors as well. I have to mention that all of the Mezcals from Mezcal Vago, such as their Espadin, Elote, and Mexicano, are delicious and worthy of your tasting. Runner-Up Favorite Mezcal: The Del Maguey Papalote is produce in the region of Puebla and only recently was allowed within Mezcal DO. Papalote is the Puebla name for the Tobala agave and Del Maguey wants to use the regional name out of respect for the region and family producing the Mezcal. This Mezcal is made in a traditional way, roasting piñas in a horno, fermenting in an open air vat, and distilled for about 35 hours in a copper pot still. This Mezcal is complex and intriguing possessing more of a floral aspect and fruit flavors of pear and apple. There is only a mild smokiness, and a very lengthy finish. This was an elegant Mezcal, another one which you will want to slowly savor with good friends. Favorite Mezcal Bars: Everyone knows about the local Tequila bars, but many people don't know where they can find excellent Mezcals lists. Thus, I created a list of Mezcal Bars in the Boston Area, defined as spots with 20+ Mezcals on their drinks menu. The list includes Tres Gatos in Jamaica Plain, The Painted Burro in Somerville, Lone Star Taco Bar in Allston & Cambridge, Ole Mexican Grill in Cambridge, and Ameluto Mexican Table in Waltham. Rosa Mexicano, in Boston, needs to be added to this list after their updated their drinks program, adding more Mezcals. If you want to explore Mezcal, and you should do so, then check out these bars. Favorite Brandy: The Christian Brothers Sacred Bond Bottled-In-Bond Brandy, produced in California, has been produced in a single distillation season, by one distiller, at one distillery. In addition, it has been aged for 4 years in American white oak bourbon barrels, in a federally bonded warehouse, and bottled at 100 proof. I was very pleased with this brandy's smooth, flavorful taste. It is more full bodied, with delicious and bright flavors of red fruits and ripe plum, with mild spice notes and a vanilla backbone. There was even a hint of chocolate on the finish. Despite it being 100 proof, the alcohol was well integrated and there was only a mild heat at the finish, not what you might expect at all. With its full flavors and complexity, this would enhance any cocktail. Favorite Local Sake: Dovetail Brewery opened in Waltham this year, making small batch Sakes, including the Nakahama Junmai and Omori Nigori. They use Yamada Nishiki rice, grown in Arkansas, which is considered the King of Sake Rice. These two Sakes are also Namazake, unpasteurized Sake. The Nakahama Junmai has a touch of sweetness and presents a smooth and fruity taste, some melon and pear. The Omori Nigori is a bit more full-bodied and sweeter than the Junmai, though it is far less sweet than many other Nigoris you will find. There is lots of fruit, a bit more tropical, flavors in the taste. Dovetail is available in numerous local stores and restaurants so seek it out. Favorite Greek Spirits: I've previously discussed the compelling wine list at Committee but they also offer an intriguing range of Greek spirits, including ouzo, tsipouro/tsikoudia, and mastiha. The spirits are offered in various tasting sizes as well as tasting flights. The range of their Greek spirits presents plenty of diversity and most are designed to be either aperitifs or paired with food. For a long time, it is almost impossible to find these spirits at local restaurants but that is changing with the influx of new Greek restaurants. However, Committee is a great spot to learn all about these fascination spirits. Take and chance and expand your palate. Favorite New Spirit: This year, I immersed myself in learning about Baijiu, the most popular spirit in the world! Yes, in there world as so many Chinese drink it in their native country. It is a fascinating spirit, produced in a unique process and I wrote eight articles about it this year. To start, check out Baijiu: The Durian Fruit Of The Spirits World (Part 1), which has links to the other articles. Baijiu is just starting to catch on with the non-Asian market and you will hear more about it in the coming years. Less than 10 Baijiu brands are currently available in the Boston area but many of them are good choices, and you will find a number of restaurants making Baijiu cocktails. Learn more about Baijiu and maybe you'll find a new favorite spirit too. Favorite Baijiu: The Shui Jing Fang Wellbay Baijiu is produced at the oldest verifiable distillery in China, having been founded in the Sichuan province in 1408. This Strong Aroma Baijiu is made from a blend of 36% sorghum, and 64% other grains, including rice, glutinous rice, wheat and corn, and has a 51% ABV. The palate on this Baijiu presented an intriguing melange of flavors, including tropical fruits like pineapple and banana, with hints of licorice and some earthy notes. It was smooth and well balanced, with a lingering finish, ending with a slightly bitter note. With its earthy element, this wouldn't be the best Baijiu to introduce to a newcomer, but it also isn't overly earthy and I enjoyed it very much. Favorite Sherry Bar: Taberna de Haro wins this category hands-down as there is no other local restaurant which comes close. With over 60 Sherries, including some rarer bottlings, Chef/Owner Deborah Hansen has compiled an amazing Sherry list, offering a good number by the glass. The Sherries pair very well with her Spanish cuisine and I could easily sit at the bar all night sampling different Sherries, from a bone dry Fino to a sublime aged Palo Cortado. If you are ever in the area, you must stop here and try some Sherry. Favorite Restaurant Cocktails: Here is a short list of five of the best cocktails I enjoyed this past year. Chicha Sour: At Tico, they created several new cocktails for the Nikkei menu and the Chicha Sour is their a take on the classic Pisco Sour. It is made with Barsol Pisco, Chicha (a corn based beverage), and fresh lime. It is a mild drink of subtle flavors, a little sour and sweet (likely from the corn) with a soft flavor of Pisco. It goes down easily and you could drink several of these in the course of an evening. Bloody Marietta: At Committee, their variation on the Bloody Mary is the Bloody Marietta, made with vodka, olive tapenade, EVOO, rigani, basil, Tabasco, and a spicy feta stuffed olive. It was a savory and delicious variation, with intriguing olive notes, a mild spiciness and seemed lighter than other such cocktails. It went down very easy and makes you crave another. The New Frontier: At Wu Er Barbecue, the New Frontier ($11) is made with Hong Kong Baijiu, Tequila, Garam Masala, Lime Juice, Bell Pepper & Thai Chili. It is absolutely delicious, one of the better cocktails I've enjoyed as of late. The Baijiu takes a prominent role and is definitely evident in the drink, which is only mildly hot but with an intriguing spicy aspect. This cocktail pairs very well with their cuisine, including the five-spice & garlic chicken. We Can't Elope: Also at Committee, the We Can't Elope is made with Soul Cachaça, cucumber-cantaloupe syrup, and fresh lime juice. Bright and refreshing, you could taste the Cachaça, which was enhanced by the fruit flavors. It is a perfect summer cocktail. Roffignac: At A&B Burgers, the Roffignac, which was created for a Cajun dinner, is made with Courvoisier VS Cognac, Strawberry Cardamom Shrub, and Soda. It is a classic New Orleans cocktail, but seems to receive far less attention that many other cocktails from that city. It is mildly sweet with a little tartness, plenty of red fruit flavor and mild bubbles. This is an excellent and refreshing summer cocktail and is worthy of much more attention in the local cocktail scene. Favorite Frozen Cocktail: At the Battle of the Burger, Chef Ming Tsai created a Dark & Stormy Granita, using Mount Gay Rum. It was a refreshing and delicious "slushy" and I wish I could have savored a large glass instead of the tiny paper cups it was served in. I like the Dark & Stormy cocktail, and its blend of ginger beer and rum, and this granita presented that blend in a frozen delight. I'm going to have to make these at home next summer. Favorite Warm/Hot Cocktail: Committee wins another category with their Greek Rakemelo. This drink, which extends back to the 12th century, is commonly a blend of Tsipouro/Tsikoudia with honey, aromatic herbs and spices. At Committee, they create their Rakomelo with Tsikoudia, honey, clove and cinnamon and will serve it warm during the winter and cold in the summer. I tasted the warm version and it reminded me of hot, spiced apple cider without the apples. It was easy drinking, more savory and only minimally sweet, with plenty of flavors of fall spices. The alcohol was well hidden within the drink so you could easily finish one of the carafes without realizing how much alcohol you might have consumed. With the cold winter revving up, hot Rakemlo is going to be the perfect solution. Favorite Cocktail Series: This year, I concentrated on one of my favorite cocktails, the Manhattan, writing a three-part series, including Then & Now (Part 1), Creating Your Own (Part 2), and Drink Up (Part 3). I delved into its history, how to create your own Manhattan at home, and provided some of my favorite Manhattans at local restaurants and bars. Though it may seem like a simple cocktail, it actually possesses much more complexity and its taste profile can vary dependent on how it is prepared. It is an excellent winter drink, though I enjoy it during the summer as well. Favorite Beer: I dislike most beer, as I am very sensitive to the bitterness of hops and that taste turns me off. Every once in a while though, I find a beer that does appeal to me. This year, I was impressed with the Night Shift Harborside, is a Gose-style ale that was brewed with coriander and Island Creek Oysters. The Harbourside is a traditional Gose in many ways, being a top-fermented wheat beer and a 3.6% ABV. However, instead of adding sea salt or salted water, they produced the batch with the addition of about 350 live oysters to the wort a few minutes before the end of the boil. I found this beer to be crisp and refreshing with a bright lemon taste, mild coriander spice, and a strong briny element which I very much enjoyed. It made for an excellent summer drink, sour and salty, and lacked the bitterness I find in many there beers. Even if you think you don't like beer, you should taste the Harborside as it may change your mind. Favorite Local Hard Cider: I've tasted plenty of hard cider this year so it was tough to decide on my favorites. The overall quality of local cider keeps improving and producers have been experimenting, making some intriguing variations. In the basic category, I'll give it to the Whetstone Ciderworks Orchard Queen, located in Vermont, which is made from a blend of apples including Lamb Abbey Permian, Orleans Reinette, Co'x Orange Pippin and Kingston Black. This is dry and crisp, with a strong tart apple flavor and mild citrus, but it also possesses an earthy element, a complex and intriguing aspect that appealed to me. I would pair this with other umami dishes, from sushi with soy sauce to mushroom risotto. Favorite Local Flavored-Hard Cider: Another Vermont cidery, Citizen Cider produces over 10 different types of cider, a diverse portfolio of intriguing ciders. The Citizen Plum Intended is intriguing as it is made with Sake yeast, as well as co-fermented with macerated plums, from a local Vermont orchard. It is delicious, only mildly sweet, and has a subtle plum flavor overlying the crisp, apple flavors. This would be a nice food cider, maybe pairing well with some Asian cuisine. Favorite Local Barrel-Aged Hard Cider: And from still another Vermont cidery, the Shacksbury WhistlePig Barrel-Aged Cider is a blend of about 90% bittersweet apples and 10% grocery apples, including McIntosh, Empire, Cortland, Dabinett, Somerset Redstreak, Browns, Michelin, and Ellis Bitters. With a 6.9% ABV and 1% residual sugar, this cider saw a slow, partial native yeast fermentation. Then it was aged in Whistlepig barrels, which were previously Sauternes barrels, for about six months. I found it to be more full-bodied and smooth, with a complex melange of flavors, including caramel, honey, vanilla, mild spices and some fruity notes, mostly apple but with some citrus and pear as well. It has only a small touch of sweetness and mild effervescence. A fascinating cider, I think this would be great with cheese. Favorite Local Hard Cider Rosé: And from still another Vermont cidery (are you sensing a theme here? ), the Eden Imperial Rosé is produced from heirloom apples, red currants, and a touch of ice cider. At 11% ABV, it is off-dry, with a mild effervescence, and is fresh and crisp with delicious apple and currant flavors, blending together well. It is tasty on its own, though would pair well with food too, and this would be great on your holiday table at Thanksgiving. Favorite Local Unique-Hard Cider Product: Eden Speciality Ciders also produced two fascinating cider products, essentially an "Apple Vermouth" and an "Apple Amaro." The Eden Orleans Herbal Aperitif, similar in some respects to a Vermouth, is made with Vermont apples and then infused with organic herbs, with Basil and Hyssop being the primary herbs. On the nose, the cider presents an alluring aroma of herbs with apple hints and on the palate it is savory and interesting, blending apple flavors with floral notes, herbal accents and a touch of honey. With a lengthy, satisfying finish, this is an intriguing and compelling cider, a unique blend which has lots of potential. The Eden Orleans Bitter Aperitif, similar in some respects to an Amaro, is a cider made with red currant, dandelion, angelica, and gentian. It possesses a complex and fascinating taste, with a potent bitterness, enhanced by more subtle hints of red fruit and apple. It too should be an excellent ingredient for a variety of cocktails. These are both unique, delicious, complex and versatile. Favorite Apple Ice Cider: The Windfall Orchard, located in Vermont, is a small farm and produces the tasty Windfall Ice Cider, a blend of 30 varieties of apples, including 50% heirloom and 50% traditional cider apples. Some of the traditional cider apples include Roxbury Russet and Esopus Spitenburg. It has a wild fermentation as well as a secondary fermentation, with some ice cider as a dosage. It ends up with a 9% ABV and 15% residual sugar, and tastes mostly dry with good acidity. It has a prominent and complex apple flavor with savory notes. There are also notes of honey, dried fruit and almost ripe pear. An excellent dessert wine. Favorite Spanish Cider: From the Asturian region of Spain, the Fanjul Sidra Natural is a traditional, unfiltered sidra made from a blend of Asturian apples, such as Clara, Blanquina, Raxo, De la Riega, Xuanina, Perico, Verdialona, Regona and Durona de Tresali. One of its only non-traditional matters is that the sidra is fermented in oak rather than traditional chestnut. This is a dry cider, with a strong earthiness, intriguing apple flavors, some nutty accents and some tartness on the finish. Such a delicious and compelling cider, and very different from most American-made ciders. I love its strong umami element, seeing some similarity to Kimono/Yamahai Sake. Runner-Up Favorite Spanish Cider: Another Asturian cider, the 1947 Sidra de Nueva Expresion is a petillant semi-dry cider made in a more modern style. It is a filtered sidra, made from estate apples, and possesses a strong, appealing apple aroma. On the palate, it presents as mostly dry, with only the slightest hint of sweetness, with a mild effervescent, enough to be a nice palate cleanser. It has delicious apple flavors with a lengthy pleasing finish. Favorite Pear Cider: Also from the Asturian region, the Viuda de Angelon Sidra De Pera is a sparkling off-dry pear cider, a perry. Using estate grown pears, this is an impressive and delicious cider, with a harmonious blend of earthiness with subtle pear flavor and a mild effervescence. It is dry and refreshing, with more depth than most perry ciders I have tasted before. Favorite Fermented Maple Syrup: Produced by Fernleigh Cellars in Vermont, the the Maple Reserve Special Dark is is a unique fermented maple syrup and actually reminded me of a Sherry. It is well balanced and fascinating, delicious and complex. It reminded me of a sweet Oloroso Sherry with a sweet & salty taste, with nutty notes and even some minerality. The pleasing finish lingered for a very long time and I was mesmerized by the flavors in this wine, amazed that maple syrup could create something this good. Favorite Non-Alcoholic Drink: At Tasting Counter, they offer a palate cleanser, the Schisandra Berry Tea, which is compelling made from an Asian berry sometimes called the five-flavor berry. The cold brewed tea is sweet and salty, sour and bitter. It is refreshing and delicious, a nice palate cleanser though it would probably pair well with various dishes too. I really want to make a Sake cocktail with this tea. Runner-Up Favorite Non-Alcoholic Drink: At Asta restaurant, I also had an interesting palate cleansers, the Sassafras Float, made with Fennel Sorbet. This bubbly drink had hints of root beer but was more dry than sweet, with clean flavors that were amplified by the compelling fennel sorbet. Tasty and compelling, it is a fine palate cleanser though it too could pair well with various foods. What were some of your favorite spirits and drink-related items this year? Let me continue my collection of lists of my best recommendations and favorites of the past year, 2016. On Wednesday, I posted my list of my Favorite Restaurant Dishes of 2016 and yesterday, I posted my Favorite Restaurants & Top 50 list. Now I want to address my favorites for other Food-Related Items, from culinary school to food events, seafood to candy. This is certainly not a complete list but it is more a sampling of memorable matters I have experienced and posted about over the past year. 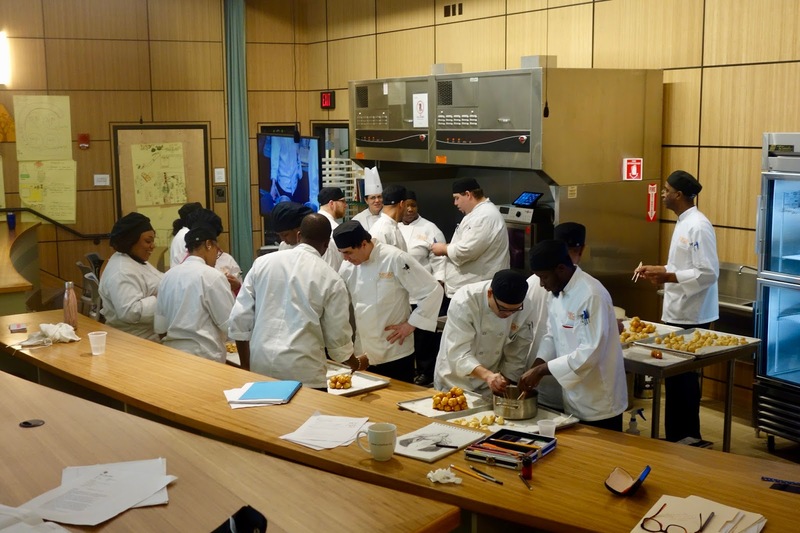 Favorite Culinary School: Nothing else touched my heart this year as much as NECAT, a local culinary school which trains people from challenging backgrounds, from ex-convicts to recovering addicts, from the homeless to the chronically unemployed. 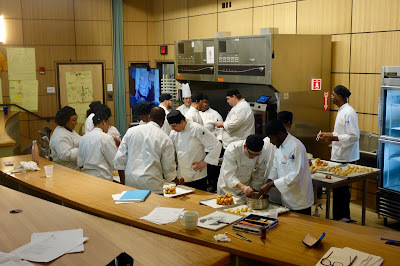 NECAT fills the important need for culinary help while helping numerous people achieve a better life. It is such a worthy school and I want to raise its visibility, so that its good work can continue and even expand. I'll be talking more about NECAT in 2017 as it is a cause I believe in and which benefits our community in a number of ways. Favorite Food Trade Event: For the sixth year in a row, I have selected the Seafood Expo North America (SENA) as my favorite. It is a massive trade event, a three day event showcasing purveyors of seafood and related vendors. You'll find tons of free seafood samples and learn plenty, from sustainability to cooking. The Seafood Show is an engaging event and I often write numerous articles about what I learn about there. The Seafood Show is compelling on many levels and I look forward to attending the next SENA in March 2017. Hope to see you there too. Favorite Seafood Trend: There had been a slow decline in the amount of Seafood Consumption in the U.S., despite the USDA and other authorities stating people should consume about 26 pounds of seafood each year. Consuming seafood is a great way to reduce heart disease and prevent other medical issues too. In 2005, we saw a significant gain in seafood consumption, almost an entire pound, to 15.5 pounds. It is still much lower than it should be but it is positive progress and we can only hope that the trend continues and people continue eating more seafood. Favorite Food Magazine: For the sixth year in a row, Lucky Peach easily prevails as my favorite. This quarterly magazine is eclectic and irreverent, with fascinating articles, essays, recipes, and more. I eagerly devour each issue, which usually has a specific theme, when it is released and its quality has remained consistent. It entertains and educates, as well as providing much for reflection. If you love food and are not reading Lucky Peach, then shame on you. Favorite Food Book: In Pastrami on Rye: The Rise & Fall of the Jewish Deli, Ted Merwin explores the history of the New York Jewish deli, from its origins to the present day. During this exploration, Merwin also mentions Jewish delis in other U.S. regions, including Boston, though the majority of the book centers on New York. It is a fascinating history of the New York deli and you'll find much of interest in its contents. I would have liked to see more information about some of the dishes served at the delis but hopefully Merwin will write a sequel to continue the compelling story he has begun. Favorite Food Contest: For the second year in a row, the Battle of the Burger wins this category. It is was a fierce competition, presenting plenty of delicious and inventive burgers for tasting. And who doesn't love the opportunity to taste more than 20 different burgers? It is a full scale event, with music, wine and cocktails to complement all of the burgers. The event didn't get too crowded until later in the evening, giving me plenty of time to savor burger after burger. I recommend you check out this event next year. Favorite Food Trend: It is only in its infancy in the Boston area, but I'm hoping it makes a significant impact. Nikkei cuisine, at its most basic, is "the cooking of the Japanese diaspora," and thus varies dependent on where the Japanese settled as they adjusted and modified their cuisine, using different local ingredients and cooking styles. Nikkei cuisine is prominent in Peru and this past year, there was a late night Nikkei menu at Tico, showcasing this cuisine and I loved what I tasted. This month, a new restaurant, RUKA, just opened and it too offers Nikkei cuisine. I haven't been there yet but the menu looks promising and I will be visiting it in the near future. Let us hope more Nikkei cuisine comes to Boston too. Favorite New Farm: I was thoroughly impressed with Little Leaf Farms, a hydroponic lettuce farm in Shirley. and wrote a series of three article about it, including Part 1, Part 2 and Part 3. The lettuce is local, yields are high, and it tastes delicious. As most lettuce comes from California and Arizona, it is great to have a local option, including one where almost no human hands touches the lettuce. This is the future of lettuce and you need to check out their products at your local supermarket. Little Leaf hopes to expand in the near future and that would help increase production and let more local people enjoy this local, sustainable product. Favorite Cheese Shop: When it comes to cheese, the suburbs reign supreme once again with the Concord Cheese Shop, which commonly stocks 150-200 cheeses, including many local cheeses. The staff is very knowledgeable and passionate about their cheese, and they are always seeking out new cheeses for their stock. Besides all that cheese, they also carry a variety of other gourmet foods as well as wines and beers. It is an excellent destination for many reasons. Favorite Frozen Seafood: Stuffed clams are a traditional New England dish and Matlaw's Stuffed Clams does it right. They are inexpensive, come in a variety of flavors, are easy to prepare and are quite tasty. If you served them to guests, they probably would not even know they had been frozen. The Bacon & Cheese Stuffed Clams had a nice smoky flavor and plenty of cheesy goodness while the Chorizo Stuffed Clams had a nice spicy kick. Plus, these stuffed clams are processed locally, in Gloucester, which gives another reason to support these products. Favorite Chips: At this year's Burger Battle, I sampled the Late July Snacks Sweet Potato Multigrain Tortilla Chips and really enjoyed them. They were thick, crunchy and flavorful, with a nice spice to the taste. And they are healthier than many other snacks so are something you should seek out at your local supermarket. Favorite Cider Donuts: There are basically two types of cider donuts, the soft ones like at Russell Orchards in Ipswich, and heavier, more cakey cider donuts that you can find at a number of other farms. My favorite are the ones from Russel, which are soft and moist, with a slightly crusty exterior, and the right balance of apple and spice flavors. And when they are warm, it's hard not to eat several on your way from the cash register to your car. With the heavier style, they tend to be more dry, less moist, and you need to have a drink with them to help wash down the dry donut. They also feel heavier in your stomach so that you rarely want more than one. Even warm, they still feel heavy and dry, and just don't satisfy like the lighter style. Favorite New Candy: Though they are only available in Japan, the Sake-Flavored Kit Kats are awesome. These Kit Kats are created with a Sake powder which is added between the white chocolate and wafers, and the candy actually has an alcohol content of 0.8%. When you break them open, you can detect a subtle aroma of Sake, a hint of steamed rice and melon. And when you taste it, you get a mild Sake note amidst the sweet white chocolate and crispy wafer. And the more you ear, you'll realize there is more of a pleasant Sake aftertaste. You can find some on Ebay and they are worth picking up. Favorite Dessert & Wine Combination: McCrea's Candies makes a variety of delicious caramels and I've been enjoying their caramels since 2012. They are a local company and have been regularly exhibiting at the Expo. This year, they were involved in my favorite food & wine pairing of the Boston Wine Expo. I enjoyed their Black Lava Sea Salt Caramel with the Bodegas Hidalgo-La Gitana Alameda Cream Sherry. The sweet and salty caramel went well with the complex flavors of the Sherry, including its nutty, briny and caramel notes. A magical combination. Let me continue the lists of my best recommendations and favorites of 2016. I have already posted my Top Ten Wine lists and my Top Ten Favorite Restaurant Dishes of 2016 and now I want to address my Favorite Restaurants of the past year as well as my Top 50 Restaurants. Top Restaurant Experience: For the second year in a row, my top dining experience took place at Tasting Counter in Somerville. The cuisine is inventive, complex, beautiful and absolutely delicious. The setting is cool and intimate, a twenty-seat counter where you can also watch the chef and kitchen staff preparing your food. They possess the largest Sake menu of any non-Asian restaurant in the Boston area and also have an intriguing selection of natural wines. Chef Peter Ungár has received numerous well-deserved raves and I continue to give Tasting Counter my highest recommendation. As I've said multiple times before, Chef Ungár is one of best chefs in the Boston area and you need to dine at his restaurant. Favorite Seaport Restaurant: Committee, a Greek & Mediterranean restaurant, opened in July 2015 but I didn't start dining there until 2016, and became an immediate fan. The food is amazing, the wine list has many excellent selections and it has a top-notch cocktail program. You'll find intriguing Greek Spirits and compelling Greek wines. They also hold some delicious and informative wines dinners, such as a Taste of Cyprus. For my birthday this year, I could have dined anywhere I desired and I chose to go to Committee. It is the highlight of the Seaport neighborhood, but would be one of my favorites no matter where in Boston it was located. Favorite Casual Restaurant: Last year, Ciao! Pizza & Pasta was my favorite new restaurant and it continues to be a top favorite, and I've probably dined there more than any other restaurant during the past year. The food and service remain consistently excellent, and I love their wood-fired pizzas and house-made pasta dishes. Prices are very reasonable considering the quality and quantity of food you receive. The owners, Edson Coimbra and Chef Marvin Posada, are the nicest and most genuine of people. I've brought many people here and everyone who has accompanied me has loved the place. If you haven't dined here yet, you need to make a New Year's resolution to immediately remedy that. Favorite Tasting Menu: Asta only serves a few different tasting menus, and their cuisine is creative and tasty. It is a casual spot, with a homey atmosphere, and you'll be delighted at the elevated level of the cuisine. Be adventurous and you'll appreciate some amazing dishes. Their wine list is small but well-curated, with plenty of interesting selections. The restaurant received plenty of positive press after its opening, but it seems to have fallen off the radar of many, but it needs to return to your attention as they are producing compelling food. Favorite Burger Restaurant: A&B Burgers opened in Beverly this year, having moved from Salem. They make a damn fine burger, using quality ingredients and a high-tech cooking device that enables them to slow cook their burger, without drying it out, before they grill it. The Sweet & Salty Cow is delicious, with Buratta, bacon, and fig jam while the new Shepherd's Pie burger, on their New Fall Menu, is also excellent. Besides their burgers, they make plenty of other delicious dishes, from Smoked Gouda & Chorizo Mac n' Cheese to Korean Sticky BBQ Wings. Their desserts are compelling too, from Churros to Apple Dumplings. They have a huge tequila list, make tasty cocktails as well as creamy adult milkshakes. You should visit here if you enjoy a great burger, or just excellent food in general. Favorite Southern Restaurant: Located in Wakefield, The Porch is a casual Southern restaurant which makes all of their dishes from scratch. From scrumptious Fried Chicken to tasty Meatloaf, from tender Brisket to hearty Chicken Fried Steak, there is plenty of comfort food to please your belly. Get a side of their fresh baked (and amazing) Biscuits, with honey butter, or a slice of Cornbread. They even have an excellent Brunch on Sundays with some of the best bacon around. Prices are reasonable, especially on the Family-sized dinners, which can feed a family of four. They even have a liquor license, so you can enjoy a cocktail, local beer or wine with your meal. Favorite Pop-Up Restaurant: Pop-ups are a great way to introduce people to some amazing food where the chefs don't have their own restaurant yet. Chef Moe Kuroki of OISA Ramen is bringing superb ramen to the Boston-area, participating in numerous pop-ups. I've attended a couple of these events, each time thoroughly impressed by the deep and complex flavors in her ramen. She often hand-makes her noodles and making the ramen is a lengthy process. Chef Kuroki is also passionate and personable, obviously in love with ramen. Favorite New Seafood Restaurant: The menu may be small, but Luke's Lobster delivers on what it does serve. Their Lobster Roll is the king of their menu, their most popular item, but don't ignore the other items such as their Lobster or Crab Grilled Cheese. It is a casual spot and take-out is popular too. Prices are reasonable for the amount of seafood you receive in each dish. And I love the fact that they only serve sustainable seafood, which is certainly tough to find in many casual spots. Favorite Brunch Restaurant: This was a tough choice as I've been to some excellent brunches this past year, but I'll give the crown to Puritan & Co., especially because of their large and creative pastry bar. They offer both breakfast and lunch options, such as the excellent Beef Patty Melt. You can also enjoy a cocktail, such as a Bloody Mary or House Mimosa. No matter what though, you must get a few selections from their Pastry Bar, such as Chocolate Pretzel Croissants, Indian Pudding Doughnuts, S'Mores Pop Tarts and more. Such a decadent culinary pleasure. Runner-Up Brunch Restaurants: I have to give some recognition to two other local brunches which I also recommend. Committee offers plenty of Greek-inspired brunch dishes, from Tyropita to Bougatsa, as well as lots of interesting cocktails, such as the Pigs & Booze and Bloody Marietta. A&B Burgers also has an excellent menu of brunch options, including Burgers and Southern Biscuits & Gravy. And you should get one of their Sticky Buns. Favorite Closed Restaurant: I am sad that AKA Bistro, which was in Lincoln, closed this year. It was one of my favorite spots, and my last dinner there, an amazing Sushi Dinner, showcased its excellence. However, it was a necessary business decision due to a number of factors beyond the control of the owners. I'm hoping the owners return to the restaurant world as it is a big loss without then. Chef Chris Chung is still around, appearing at a number of pop-ups, since the closure and I highly recommend you check out one of his events. Favorite Rhode Island Restaurant: Matunuck Oyster Bar offers plenty of delicious local seafood, including oysters that they harvest in their own waters behind the restaurant. The seafood is reasonably priced, with ample portions, and they have a good wine list and cocktail program to accompany your food. They offer some Rhode Island seafood specialties and if you travel through Rhode Island, it is well worth making a stop here. And definitely order some of their Bourbon Oysters! In addition to the Favorites listed above, I've compiled a list of my own Top 50 Restaurants, those Massachusetts places where I'm sure to always have a delicious meal, whether a casual breakfast or a high-end French dinner. These are the places I seem to recommend the most to others, including some places where I dine on a regular basis. Many of these places have been listed on prior Favorite Lists, some for multiple years, and are all worthy of recognition and recommendation. There are also some new Favorites, places I only recently encountered but which I know I will be returning frequently. Please note that this is not a list of the "Best" Boston-area restaurants, but my own personal favorites. Let me continue the lists of my best recommendations and favorites of 2016. I have already posted three Top Ten Wine lists and My Favorite Wine-Related Items. Now I want to move toward food, and showcase my Favorite Restaurant Dishes of the past year. This list includes ten dishes which I not only enjoyed immensely, but which I also found to be particularly compelling for various reasons. They might be especially delicious or something more unique, but all stand out for some particular reason, above the other dishes I have tasted this past year. These are the type of dishes I would order again and again, and which I would highly recommend. For the second year in a row, this dish has made this list, because it is so absolutely compelling. It is hearty and delicious, with plenty of creaminess in the sauce, lots of spicy meat, and crunchy bits of chorizo. The house-made campanelle pasta is always cooked perfectly and is an excellent vehicle for the bolognese. Whenever I dine at Ciao, I almost always order this dish and it is consistently excellent. I should also note that everything at Ciao, from their other pasta dishes to their pizzas are also consistently excellent and any of those items could easily be on this list too. OISA Ramen does pop-ups at various locations and you need to check out one of their upcoming events. Chef Moe Kuroki makes a stellar bowl of Ramen. The plentiful pork belly melts in your mouth, like pork fat butter, and easily falls apart against the edge of a spoon. The broth is savory and complex, with an intense umami element, a salty edge and some heat from a peppery topping. The flavors are deep and balanced and it wasn't too salty in the least. It is like a bowl of liquid pig. The thin noodles have a nice bite to them, a good textural element. I could easily devour a second bowl of this compelling ramen, especially accompanied with an umami-rich Sake, like a Kimoto/Yamahai. Bistro du Midi is worthy of more attention that it receives and I've enjoyed a number of excellent meals there. 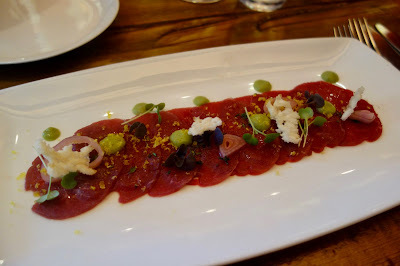 The superb Lamb Carpaccio came with a cured egg yolk, castelvetrano olive, and rice crisps. The thinly sliced venison was silky smooth, with a nice, meaty flavor, and only a hint of a gamey taste (which was a nice addition). This is another dish which I could have enjoyed multiple dishes, chowing down all of that luscious lamb. At Tasting Counter, every dish is a work of art, carefully crafted, well-balanced, and delicious. Chef Peter Ungár is one of the top chefs in the Boston area and if you haven't dined here yet, you need to get here as soon as possible. 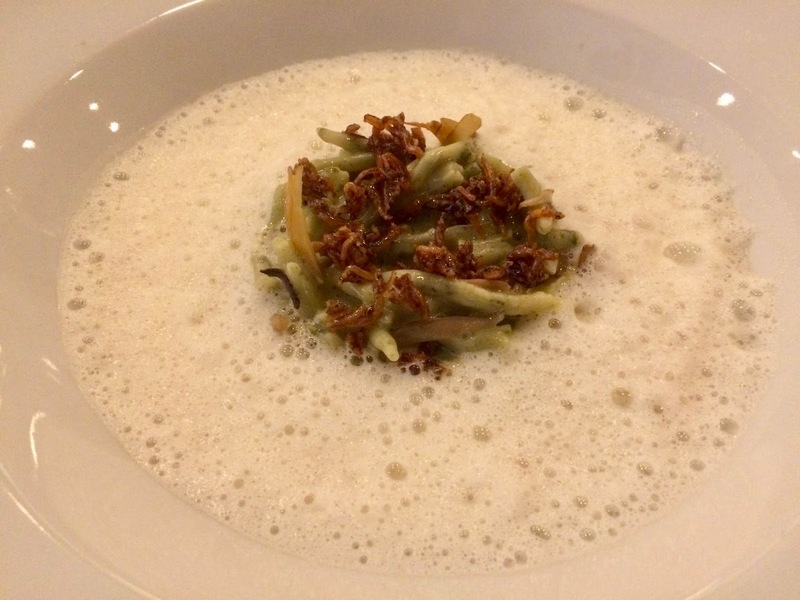 This intriguing pasta dish was made with hen of the woods, sea urchin custard, anchovy, and bonito. It is a taste of the sea, full of umami and briny goodness, with a pleasing earthy element. Any of Chef Ungár's dishes could also end up on this list and I can't recommend Tasting Counter enough. Posto has long produced some of the best pizza in the Boston area and on my last visit, I opted for the Meatball pizza, with beef, pork & veal, topped by mozzarella, oregano and garlic. It is a hearty-sized pizza, loaded with toppings including ample, thin slices of garlic. The thin, slightly charred crust is delicious, both soft and crisp, and the meatballs are moist and flavorful. And I love all of the garlic atop the pizza. With the chillier temperatures of the season, this is a perfect comfort food, filling your belly and warming your soul. 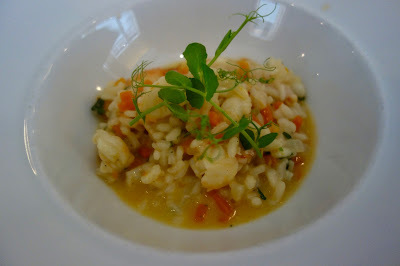 During my first visit to Ostra, at a wine lunch, I was entranced with the Lobster Risotto, with heirloom squash puree, which was filled with lots of sweet lobster meat. The rice was cooked perfectly, just that right consistency, and the broth was delicious and flavorful. One of the best Risottos I've had in some time. I need to return to Ostra very soon. Seafood and cheese is a divisive issue in the food world but I think the combination can work with the right ingredients. This Crab Grilled Cheese, with plenty of sweet Crab meat, melted Gruyere cheese, and organic white bread was an excellent comfort food. The thin slices of buttery bread were grilled and crispy while the Gruyere added some creaminess and a nutty touch to the sandwich. The texture of the crab meat worked well, and overall it was tasty and satisfying. Though I haven't yet written my review of First House Pub, they are deserving of a shout-out for this dish. You receive a mound of crisp tater tots, smothered in melted cheese and bacon pieces. The cheese has been layered throughout the dish so almost all of the tater tots are covered. Too many dishes only place cheese atop the dish, leaving much of their dish cheeseless. That isn't the case here. This is top-notch comfort food as well as a nice accompaniment to an evening of drinking. 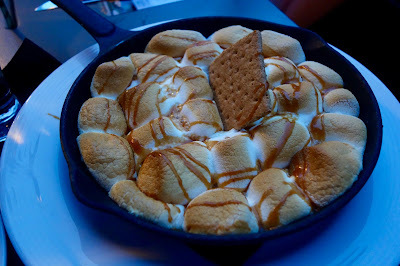 In a cast iron skillet, this S'Mores dish was delicious and decadent, a fine blend of melted marshmallows and chocolate, with plenty of graham crackers you could smear with the melted contents. It helped too that we enjoyed it outside, on a slightly chilly evening, with heaters going on the outside patio of the ArtBar. What a fantastic donut! This is a cake donut, with a firm texture and a tasty dark chocolate flavor. 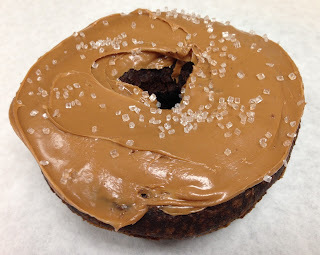 This donut also has a creamy frosting with a bright caramel flavor, enhanced by the crunchy salt sprinkled atop the donut. I love the combination of sweet and salty, especially with chocolate, and this donut succeeds well in presenting a hedonistic pleasure. Kane's makes plenty of excellent donuts and this is one of their best creations. What were some of your favorite restaurant dishes of the past year?